Archpriest Macarius Kvitkin was glorified as one of the New Martyrs for Christ in 1981 by the Russian Orthodox Church Outside of Russia and in 2000 by the Moscow Patriarchate. On February 9, the Russian Church triumphantly celebrates the memory of the Synaxis of New Martyrs and Confessors of Russia. Fr. Makary's son, Vladimir Kvitkin-Pawlenko set down the account of his life. In 1995 it was published in Orthodox Life. New Martyr Fr. Makary was born in 1882 in the town of Orsk, Orenburg Province. He was the son of the pious Fyodor and Evdokia Kvitkin. At a very early age, he came to love Christ and the Church, and was a deeply religious youth, often attending church, and reading and singing in the choir. As a young man, he first completed a course of studies at a teachers' college, and taught in a school. In 1904 Makary married Evfrosinia Kondratievna Beznosovaya, a pious maiden from a prosperous family. One year later, their first son, Sergei, was born. After several years of work as a teacher, Makary attended a theological seminary, and after graduation, was ordained a priest. Fr. Makary began his pastoral service in the town of Novo-Troitsa, Orenburg Province. Before the Revolution he served in the village of Verkhnyaya Pavlovka, 25 km. from Orenburg. There in 1918, his second son, Vladimir, was born. 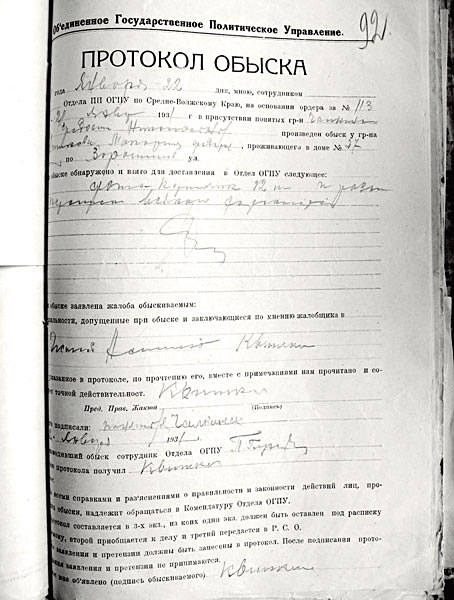 In 1920, batiushka and his family moved to Alexandrovka, Orenburg Province. At first, Fr. Makary served in a house church. In 1924, they built a small wooden church, but in 1925 it was shut down, and they moved to Orenburg. 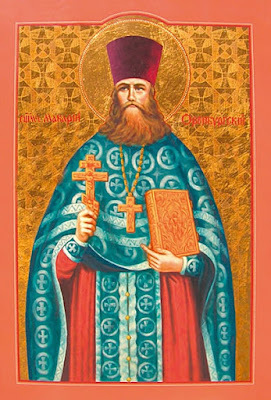 During this period, Bishop Iakov was the ruling bishop of the Orenburg Diocese. 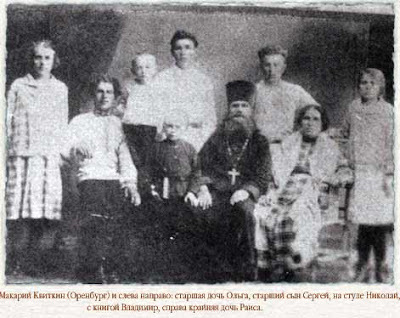 In the fall of 1925, Bishop Iakov assigned Fr. Makary to be the assistant priest in a large church in Fortstadt, a suburb of Orenburg. The church boasted three Altars; the main Altar was dedicated to St. Seraphim of Sarov. In the years 1925-26, Vladyka Dionisy was temporary administrator of the Diocese. Fr. Makary's son Vladimir was Vladyka Dionisy's staff bearer, and often traveled with him when he served in other, yet functioning, churches in Orenburg and in the convent. 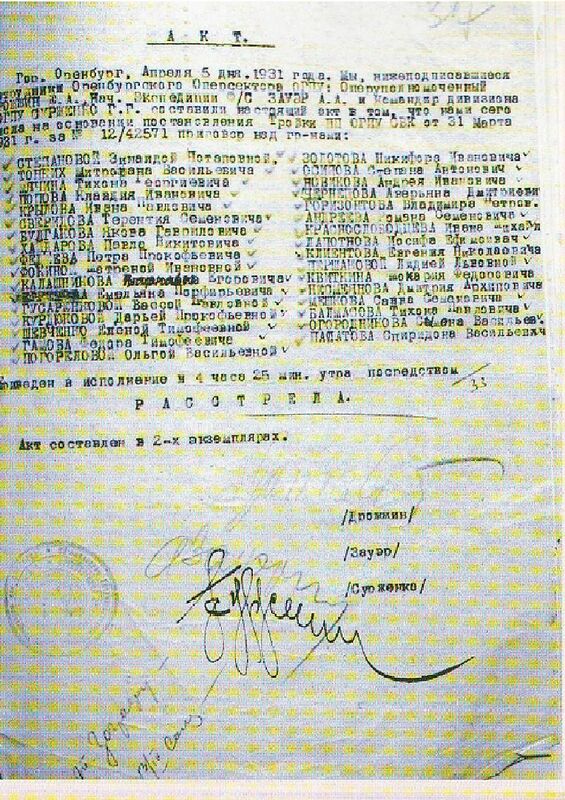 On July 16/29, 1927, Metropolitan Sergei (Stragorodsky) issued his infamous declaration. At that time, Fr. Alexei S. was rector of St. Seraphim's Church, to which Fr. Makary had been assigned as second priest. In their first few years of serving together, Fr. Alexis and Fr. Makary had a peaceful and friendly relationship. 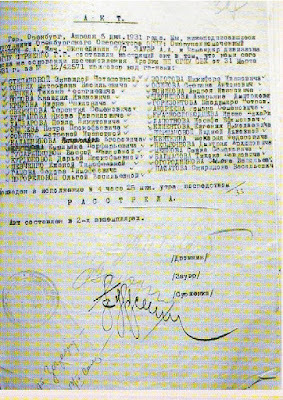 But after Metropolitan Sergius' declaration and recognition of the Soviet government, they had a disagreement with respect to commemoration of the deputy locum tenens for Patriarch Tikhon. Fr Makary categorically refused to commemorate Metropolitan Sergius, a puppet of the Soviet government, as the Patriarchal locum tenens; he commemorated Metropolitan Peter of Krutitsa, who by then had already been sent to the camps. That disagreement on understanding the Truth of the Church, the true pastoral path, caused a schism, dividing the parish into a group supporting Fr. Alexei and a group supporting Fr. Makary. Finally, the parishioners decided that the priest who garnered the majority of votes must remain as pastor of the parish. Since the parish was large (with over 1,000 parishioners), it was decided to hold the General Meeting in the church. Fr. Alexis spoke first. He rebuked Fr. 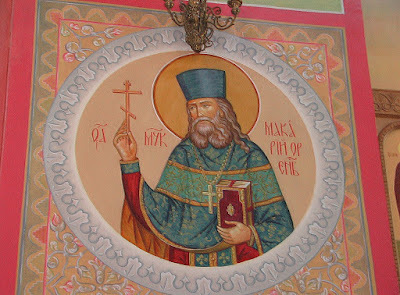 Makary for not accepting or commemorating Metropolitan Sergius, thereby showing disobedience to him, the parish rector, and causing division and schism. Fr. Makary explained to the faithful that with his declaration, Metropolitan Sergius had betrayed the Truth and had entered into an alliance with the atheists, enemies of the Church. He stated that lest he become a participant in the sin of betrayal of the Church, he could not commemorate [Sergius], and that this was the reason for the disagreement and for the impossibility of concelebration with Fr Alexei. Finally, when it came time came to vote, Fr. Alexis asked all who were for him to move to the right side of the church, and those parishioners who were for Fr Makary to move to the left. As a long-standing priest and rector of the parish, he fully expected to win a majority. The unexpected happened: the left side of the church was filled with more than 2/3 of those present. In this manner, the parishioners expressed their trust in Fr. Makary, and he became rector of St. Seraphim's Church. In that terrible time of persecution of religion and clergy, the government, intent on forcing the parishioners to close of parish, excessively taxed the parish. Each time the taxes were paid, they would raise the taxes, so as to increase them to a point beyond the parish's means. This was ordinarily done quarterly, but after the decision of the General Meeting, the government began to increase the taxes monthly. At first the parish somehow managed to meet its obligations, but then the government began to seize sacred vessels, gold and silver rizas from the icons and the Gospel book, and other valuable items, ostensibly in lieu of taxes. Finally, in 1930, they completely shut down the church, citing failure to pay taxes as the reason. By then, Fr Makary had four children: two daughters - Olga and Raisa, and two sons, Vladimir and Nicholas, 12 and 8 years respectively. The oldest son Sergei, a chanter in village of Chorniy Otrog, Orenburg Province, lived on his own. With such a family Fr Macarius took shelter in an old bathhouse that was minimally adapted to serve as a dwelling. 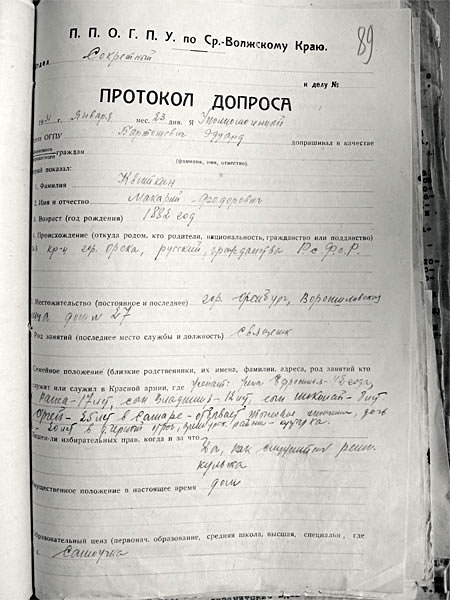 Here is how that came about: after coming to Orenburg in 1925, batiushka together with his matushka and children temporarily moved into the home of three nuns, and later rented an apartment from a certain widow. However, when her son, a Communist, returned home, he demanded that his mother have "the pope vacate the apartment." Meanwhile, Fr. Makary, who had planned to build himself a small house, had purchased a piece of land on which there was a bathhouse. Throwing out all of the implements pertinent to a bath house, they set a Russian stove with sleeping benches in the center of the room, set up a small dining table, a bed for the parents, and a trunk for clothing. The children slept on the trunk and on the [shelves at the] stove, or simply on the floor. Everyone was in one room with their parents. This tiny room, where one could walk only single file, served as their kitchen, dining room, and bedroom. It was from this bathhouse that Fr. Makary was taken to prison... The family lived on provisions brought by parishioners, who would sometimes secretly bring bread and potatoes, and who on leaving the yard would look from side to side to make sure that they were not being observed by others. The Kvitkin family received no other assistance, for they were among the "disenfranchised," i.e. those deprived of rights as citizens; this category included families of clergymen. The bathhouse in which they lived was about 4-5 blocks from the church. Each time Fr. Makary and his children would go in the morning for Liturgy, or in the evening for Vigil, they would encounter young pioneers on the street who would throw sand, and sometimes stones, at them. Batiushka ordered the children never to respond to these pranks, but rather to walk calmly, for they could expect no help from anyone. From the time that Fr Makary was left to serve the St Seraphim parish by himself, the GPU began to summon him for questioning. Stating that since the church would be closed anyway, the atheists proposed that Fr. Makary use the provincial newspaper to publicly declare that he renounced God and his priestly rank, and that he acknowledge that he had been "stupefying people with religious obscurantism." In return they promised him a job as a teacher, or possibly even school principal. Fr Makary categorically refused. Then they tried to convince him that by doing this he could save his life and the lives of his children. To that, Fr Makary replied that he was not afraid of death, and that he entrusted his children to the will of God, but that he would not, under any circumstances, break the oath he had sworn to God. The Lord did not dash the hopes of His martyr: all of his children grew up honest, faithful, and pious people. 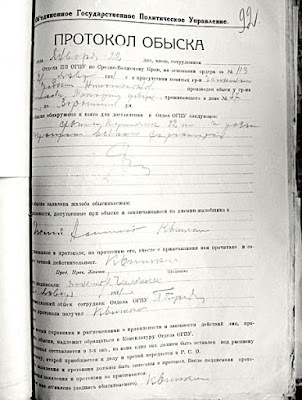 On a cold January day in 1931, the Chekists came at midnight to do a search, which lasted till 4:00 AM. Of course, they found nothing. Before leaving, Fr Macarius bade farewell to his family, blessed Matushka and the children, and he was taken to prison. Rarely, small packages of food and clothing would be accepted at the prison. On March 31, as usual, matushka and Olga, the oldest daughter, took a small package to the prison; however, it was not accepted, and no answer was given to the question as to why it was not accepted. Matushka, Olga, and other prisoners' relatives who had also brought packages decided to wait until they could hand over their packages. But at 3:00 PM all those waiting were driven away, the doors of the prison were opened and the captives - about 25 to 30 people, Fr Makary among them - were led out. Seeing his wife and oldest daughter, he waved to them from afar. He looked completely healthy. The group was led into the building of the GPU, and the relatives following were commanded to go home; they were told that if they returned at 9:00 AM on the following day, they would be told everything. Some people did not obey the order, and in anticipation continued to mill around the building housing the GPU. After several more warnings from the guards, they were surrounded and those caught were arrested. Among them were Fr. Makary's wife and daughter. They were kept in the basement until morning. Then they were given a notice that Fr. Makary had died in prison, and a very strict warning, under threat of arrest, that they were forbidden to speak of where they had been and what they had seen. Fr. Makary's matushka asked,"But where is my husbands body? I would like to bury him." In response, the director who had issued the death notice began to curse, and said, "Don't worry about a thing. The Soviet government will bury him in the manner he earned." He ordered that they leave before it was too late. Later they learned that the group consisted primarily of priests from Orenburg and from other parts of the province who were popular among the faithful, and steadfast true Christians who had gotten in the way of the satanic government. All these people, who just a few hours ago had been healthy and in good spirits, walking quietly and quickly from the prison to the GPU building, suddenly "died in prison" the next day, as certified in death notices given to the relatives. Later, secret rumors spread that all the prisoners had been taken to a basement room in the GPU where they were suffocated by poison gas. For this reason none of the bodies were released to the relatives for burial. Fr Makary reposed in the Lord on Palm Sunday, April 1, 1931. Thus did a steadfast martyr and true pastor give his life for the True Faith, a priest beloved by his parishioners, a faithful servant in Christ's pasture, Archpriest Makary Kvitkin.